Citing the legendary influence of the late former South African President Nelson Mandela, the South African Government has confirmed that it will seek to maintain positive relations with all nations, thusly negating rumors that South Africa would join Saudi Arabia and the UAE in their blockading of Qatar. While good news to Qatari ears, South Africa’s decision to chart its own course comes amidst large investments by Riyadh and Abu Dhabi into the burgeoning African nation’s internal infrastructure. On a mission to breath life into South Africa’s troubled economy, President Cyril Ramaphosa’s decision to accept Saudi and Emirati money, without acquiescing to their foreign policy demands, (as has been done by many developing African economies), risks alienating allies that would otherwise be crucial in stimulating South African foreign direct investment (FDI). The emerging actions of South Africa show that Ramphosa is uninterested in getting his nation involved in any international quagmires, and will not align the country with any of the three feuding Gulf nations. For leaders of both nations, the investment comes with benefits, but also calculated risks. For a Saudi Arabia looking to diversify its economy from energy, its decision to invest in the South African energy sector initially seems odd, however such a move is necessary if the Kingdom is to have the international influence necessary to be considered a “Great Power.” Amidst other dalliances in Africa, according to analyst Torbjorn Soltvedt, Crown Prince Mohammad Bin Salman’s (MbS) vision for a diversified Saudi Arabia, “Relies on a much more assertive policy and more active presence on the world stage.” As for the UAE, the nation matched Saudi Arabia’s commitment, also pledging $10 billion for South African economic development, however this money is expected to be earmarked for the tourism and mining sectors. For Ramaphosa, the contributions of these two nations put him remarkably closer to his overall goal of $100 billion in FDI to help resuscitate South Africa’s stagnant economy. Absent from making announcements about FDI in South Africa was Qatar. However, by boosting trade with the now partially isolated nation, South Africa recently made clear it will not be going along with the blockade. Other African countries that have been historically linked to the UAE and Saudi Arabia via FDI, (such as the Comoros and Mauritania), have followed suit with their Gulf benefactors and joined in the isolating of Qatar. Instead, South Africa has continued to signal that FDI will not turn Pretoria into a proxy for Saudi or Emirati interests. In fact, almost the opposite has occurred. Just over a year after the boycott began, South African and Qatari bilateral trade has increased by almost 70%. Additionally, South Africa is currently financing a port equipped to receive deliveries of Qatari natural gas, at the behest of private Qatari businessmen. While presenting South Africa as a prime destination for FDI remains Ramaphosa’s top economic priority, the balancing of its interests between the blockading nations and Qatar shows that his motivations are not solely linked to romantic notions about Nelson Mandela’s reputation for peacebuilding, but rather are to ensure that a now-resurrecting South Africa casts as wide a development net as possible. 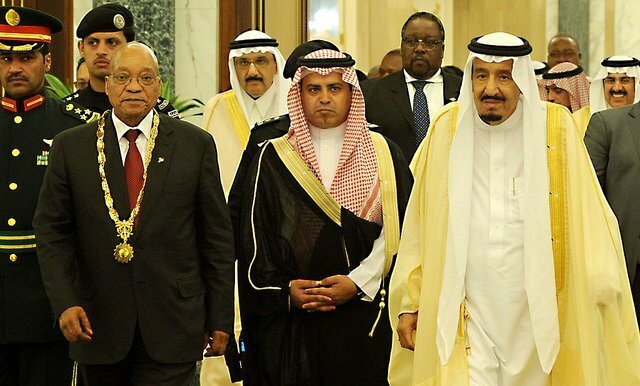 Given the importance of flexing international influence in MbS’s quests for diversification, South Africa’s apparent stubbornness in resisting Saudi and Emirati attempts at dollar-diplomacy risks alienating nations crucial to South Africa’s economic revival. Simultaneously, should Ramaphosa acquiesce to Saudi Arabia and the UAE, he would cut-off Qatari-sourced cash at a time when Pretoria’s economy has few additional options. For the time being it seems the South African leader is committed to precariously balancing these opposed interests. Perhaps too there is an element of pride involved in his decision making. Being Africa’s most industrialized nation, in resisting efforts to have its foreign policy be swayed, South Africa can retain the investment legitimacy it received at the height of the BRICS craze, sheltering South Africa from associations with some of the continent’s more economically desperate nations and continuing the allure of South Africa as a destination for FDI. “South Africa Rejects Saudi-UAE Pressure to Boycott Qatar,” The Middle East Monitor, 21 July 2018. Justina Crabtree, “Saudi Arabia to Power Up South Africa’s Energy Sector with multi-Billion Dollar Investment,” CNBC, 13 July 2018. Rene Vollgraaf, “UAE to Invest $10 Billion in South Africa,” Bloomberg, 14 June 2018.